Yes neutrinos do affect decay rates and I suspect that they are the actual drivers of decay in the first instance. Since I am able to actually model them (unpublished.) I am comfortable with that statement. Actually this is great news because I always suspected that it was the neutrino flux that triggered all radioactive decay. Keep in mind that we are only able to observe the energetic neutrinos. The rest we miss and describe as dark matter. This also suggests that it behooves us to figure out how to produce and manage a neutrino flux as it would swiftly solve our problems with radioactive materials. Understanding dark matter as neutral neutrinos also implies concentration in gravity wells. Thus managing a flux on Earth is at least conceivable and we may in fact have been doing so and not knowing it. Note that a completely neutral neutrino at its ground level will show no gravitation effect. 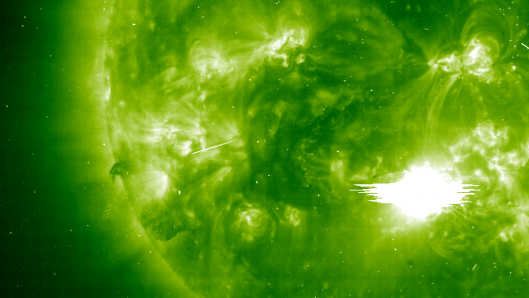 Scientists may have hit upon a new means of predicting solar flares more than a day in advance, which hinges on a hypothesis dating back to 2006 that solar activity affects the rate of decay of radioactive materials on Earth. Study of the phenomenon could lead to a new system which monitors changes in gamma radiation emitted from radioactive materials, and if the underlying hypothesis proves correct, this could lead to solar flare advance warning systems that would assist in the protection of satellites, power systems and astronauts. In 2006, nuclear engineer Jere Jenkins of Purdue University noticed a change in the decay rate of a radioactive sample 39 hours before a solar flare. Since joined by a Purdue University professor of Physics named Ephraim Fischbach, Jenkins' subsequent research has reinforced the discovery, using two samples of the same isotope, chlorine 36, in two separate experiments in two different labs. It isn't just solar flares that seem to induce changes in radioactive decay rate. Changes in solar rotation and activity, and the Earth's position on its orbital path around the Sun also appear to have an effect, and it's the latter variable which seems to have been decisive in the research. Between July 2005 and June 2011, continued monitoring has apparently shown consistent annual variation in the decay rate of chlorine 36, peaking in January and February, and ebbing in July and August. An 11-year solar cycle is set to peak in 2013, and the researchers claim a solar storm as strong as the Carrington Event of 1859 would be devastating to the technology of today. "There was so much energy from this solar storm that the telegraph wires were seen glowing and the aurora borealis appeared as far south as Cuba," said Fischbach. "Because we now have a sophisticated infrastructure of satellites, power grids and all sort of electronic systems, a storm of this magnitude today would be catastrophic. Having a day and a half warning could be really helpful in averting the worst damage." Among the proposed protection measures are the temporary shutting down of satellites (the designs of which would need to be adapted to accommodate this feature) and power networks prior to solar flares. Purdue's proposed detector uses a sample of manganese 54 which is monitored with a gamma-radiation detector as it decays into chromium 54. It's hoped that anomalies in the rate of decay would indicate forthcoming solar flares. A US patent has been filed to protect the idea. The research has significant implications for science. To date, the rate of radioactive decay is understood to be constant. Further, the researchers hypothesize that it's neutrinos that are affecting the change in the rate of decay: an idea sure to turn heads. Jenkins hopes to continue the research, verifying the findings using more sensitive equipment. The latest findings were published last week in the report Analysis of gamma radiation from a radon source: Indications of a solar influence in the journal Astroparticle Physics.